Does that sound cozy? Well, it was. Our Christian Market Writers group met last night at Starbucks, which seemed fitting during Christmas season. Five of us gathered in a corner in cushy armchairs and sipped our tea or cocoa or latte as we listened to one another's writing. We interjected suggestions and ahhed over the especially good stuff. Our fearless leader had even brought Christmas quizzes and sweet-treat prizes to end the evening. Every time I remember to thank God for bringing me back to writing, I am most grateful for my Christian writer friends. They have so warmed my insides, that when I'm with them, the rainiest, darkest night can't dampen my spirits. Give the gift of life this Christmas. Hands of Hope, a charity of Women Helping Women A World Away, is announcing that their Holiday Gift Cards are available for purchase. 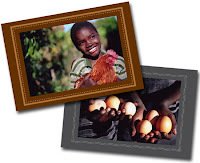 These cards provide food, income and water for impoverished women and children in Zambia, Uganda, and Southern Sudan. They can be purchased on the Hands of Hope website http://www.handsofhopeonline.org/ for $15.00, $30.00 and $50.00. 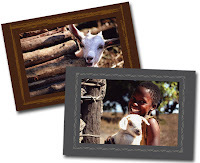 Purchasing these cards will provide goats, chickens or wells to help change lives. What could be a more meaningful gift for holiday giving for family, friends, and customer appreciation? 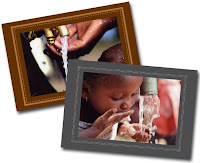 A Well Card will go toward funding a well in the Western Province of Zambia. Statistics show that nearly half of all people in developing countries suffer from health related problems caused by unsafe water. In addition, African women and children spend several hours every day collecting water.